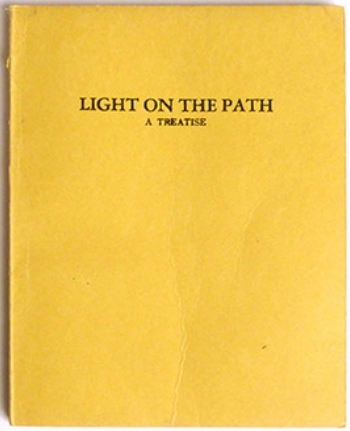 “Light on the Path” is a small book that was first published in 1885 and has remained in print ever since. The Theosophy Company edition, available from the United Lodge of Theosophists, includes the original unaltered text from 1885 (which was edited in a number of ways in Theosophical Society editions) along with a series of four explanatory articles about the book’s teachings, first published in H. P. Blavatsky’s “Lucifer” magazine in September-November 1887 and January 1888. Although written down by Mabel Collins, an English Theosophist, the book – and also the “Lucifer” articles – was inspired by One who used a triangle – △ – as his symbolic signature. HPB explained in a footnote in “The Voice of the Silence” that “The △ is the sign of the high chelas, while another kind of triangle is that of high Initiates.” (p. 79, original 1889 edition) That other kind of triangle is the ∴ symbol, which HPB was authorised to include after her own name or signature, as she sometimes did. “High chelas” and “High Initiates” are both disciples of the Masters of Wisdom and in fact they are both initiates, albeit the former of a lower stage or degree and the latter of a higher one. High Initiates are Adepts but are not necessarily Mahatmas, as “Adept” and “Mahatma” are not strictly synonymous terms. A Mahatma is indeed an Adept but an Adept is not always a Mahatma, for a Mahatma is a very high level of Adept. To us, however, someone who is still a “high chela” or △ is essentially an Adept, due to their being so far ahead of us in their inner evolution and initiatory development. HPB identified the inspirer of “Light on the Path” as “a Greek, though no Mahatma but an Adept . . . one who became an adept only in 1886,” i.e. the year after the book was published. This was, as she and others stated, the Greek-Cypriot Adept known as Illarion, Illarion Smerdis, or the Master Hilarion. In inspiring “Light on the Path,” however, he was not producing a book of his own words but was in fact rendering into English some sentences and aphorisms from the Book of the Golden Precepts, as HPB stated in a letter in 1889. This still publicly unknown esoteric text was later translated from in greater length and detail by HPB, under the title “The Voice of the Silence.” “The Voice of the Silence” and “Light on the Path” are, in a sense, companion volumes and can be studied together with great benefit. What are they? We would do well to remember them and to remind ourselves of them often. Those statements, and the book as a whole, are not intended for the general public, nor even for everyone with an interest in spirituality, although of course anyone can derive at least a little inspiration from some of its passages. 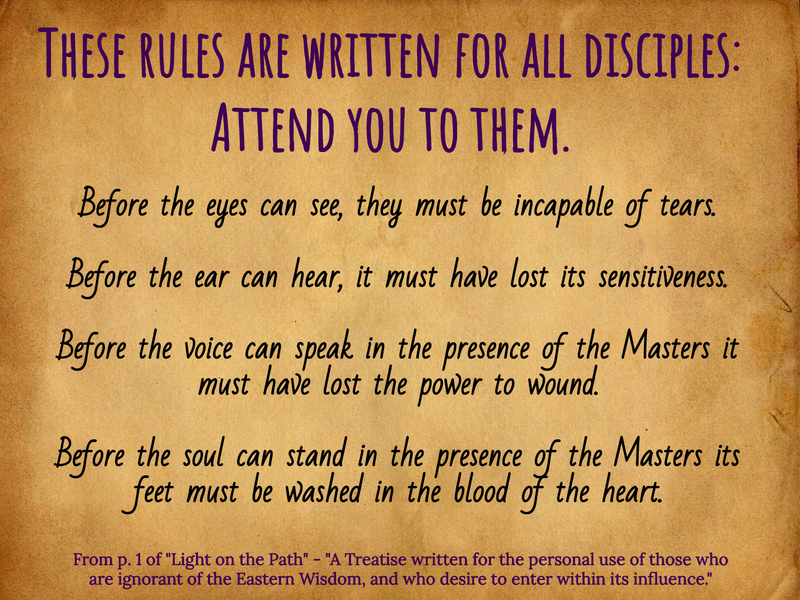 “All the rules contained in “Light on the Path,” are written for all disciples, but only for disciples – those who “take knowledge.” To none else but the student in this school are its laws of use or interest.” (p. 34) The same holds true for “The Voice of the Silence,” which HPB specifies is “for the daily use of Lanoos (Disciples)” and “DEDICATED TO THE FEW.” One does not have to already be an accepted disciple of the Masters before making use of these books; as soon as anyone seriously, earnestly, and humbly, aspires to become such, these books are for them, and to use and apply to whatever extent they currently feel capable. “Before the soul can see, the Harmony within must be attained, and fleshly eyes be rendered blind to all illusion. “The senses spoken of in these four statements are the astral, or inner senses,” says the Master on p. 35. “To be incapable of tears is to have faced and conquered the simple human nature, and to have attained an equilibrium which cannot be shaken by personal emotions. It does not imply any hardness of heart, or any indifference. It does not imply the exhaustion of sorrow, . . . it does not mean the deadness of old age, . . . None of these conditions [i.e. an inability to feel any sorrow or an emotional deadness] are fit for a disciple, and if any one of them exist in him, it must be overcome before the path can be entered upon. Hardness of heart belongs to the selfish man, the egotist, to whom the gate is for ever closed. Indifference belongs to the fool and the false philosopher; . . .
“If grief, dismay, disappointment or pleasure, can shake the soul so that it loses its fixed hold on the calm spirit which inspires it, and the moisture of life breaks forth, drowning knowledge in sensation, then all is blurred, the windows are darkened, the light is useless. . . .
“The first four aphorisms of “Light on the Path” refer entirely to astral development. This development must be accomplished to a certain extent – that is to say it must be fully entered upon – before the remainder of the book is really intelligible except to the intellect; in fact, before it can be read as a practical, not a metaphysical treatise. It may be asked why anyone would wish to undergo such a trial as that, or to open the astral senses in the first place. The motive in Theosophy is not one’s own liberation or one’s own powers; on the contrary, it is the wish to be of the utmost possible help and service to humanity, to become a true and equipped Server of the human race, to consciously, directly, and practically, aid the Great Ones in Their compassionate and selfless work. It is the Bodhisattva Ideal, the Way of the Buddhas of Compassion. But one does not and cannot become such straightaway. To start with there are preliminary initiations and preliminary steps, beginning in the ordinary circumstances of one’s everyday life and the “Daily Initiation” that invariably arises therein. Those who wish to know more are encouraged to read the book and other books of the original Theosophical literature (see the Books on Theosophy page) for themselves. One of the main aims of the present article is to draw attention to the following information . . .
How is one to give to others some of the Knowledge that he or she has already been given through the Theosophical teachings? That is for each person to work out for themselves. Not everyone is suited or has the physical opportunity to work or give talks at a ULT (United Lodge of Theosophists) Lodge; not everyone is suited for writing articles or books; not everyone is equipped to translate the Theosophical teachings into different languages; not everyone has the ability or time to set up and manage a Theosophical website or to create YouTube videos; not everyone is able to start a Theosophical study group in the area where they live; and so there must be other ways of doing it than these but these are certainly some of the methods which can have effect and can make a big difference in the lives and journeys – and, most importantly, the minds and hearts – of many people. By giving this type of help to our fellow human beings, we are giving help to the Masters and Their Work. The real Author of “Light on the Path” goes on to refer to “the news that there is knowledge and a beneficent power which teaches.” That is indeed news for many people in today’s world, i.e. the concept that Truth exists and that there are “Those who know” and, further, that “Those who know” are endeavouring to enable us to become “knowers” also. Those who think and say such things have immeasurably more of “what it takes” than those who confidently believe that they are ready and prepared and well-equipped for chelaship. The genuinely humble soul, who is vividly aware of their own shortcomings and weaknesses, stands a far better chance of succeeding in reaching the Masters than one who foolishly imagines that he or she is already advanced and well developed. Few are those reading these words who are likely to meet an Adept face to face in this life, on the physical plane, but there are some who may well at some point in this very lifetime meet actual chelas of the Adepts, and, if so, let us hope that by that time we are sufficiently inwardly prepared and have taken sufficient steps to be able to recognise them (remember, a real one will never directly say that they are one!) and to be able to consciously help them whilst also being helped by them. Let us recall, no disciple can cross the threshold without giving to humanity, and placing on record, some of this Divine Wisdom of Theosophy. Does this eternal principle not shed some light on the nature of the book “Light on the Path,” that it was a gift to us from an advanced disciple who then the following year (as said earlier, in the quote from HPB) was enabled to advance even further, becoming in 1886 an Adept? BE A LIGHT WHERE THE MASTERS’ LIGHT SHINES NOT. SEE THE ARTICLES PAGE FOR THE COMPLETE LISTING OF OVER 300 ARTICLES ON ALL ASPECTS OF THEOSOPHY AND THE THEOSOPHICAL MOVEMENT.